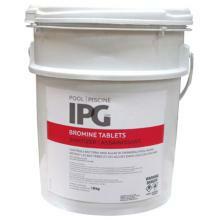 BROMINE TABLETS bromine tablets is a safe and effective slow dissolving bactericide, algaecide and disinfectant that, unlike other commonly used chemicals, performs well over a broad pH range. Use the dosages recommended below to keep your pool sparkling clean and inviting. CONTROLS BACTERIA AND ALGAE in Swimming Pool Water. 1. If using an automatic feeding device, fill the chamber(s) with tablets and adjust flow rate according to manufacturer’s recommendations to maintain proper bromine residual. Automatic brominators have use specific instructions peculiar to their design. Frequently, a brominator must be filled to capacity, while the adjustments allow the user to erode only the amount of BROMINE TABLETS bromine tablets necessary for proper disinfection as suggested below. The slow dissolving nature of the product combined with the design features of the brominator require that a greater amount of chemical be exposed to the water. 2. Initially, superchlorinate pool water, to build an initial free chlorine of 1.0 to 2.0 ppm, by adding 30 g of predissolved shock treatment per 10,000 L of water. If using an automatic feeding to set up the bromine reserve, adjust the feed rate at maximum. When the recommended rate is reached, adjust the brominator at required level to maintain the available free bromine at recommended values. 3. Add 1 or 2 tablets per 10,000 L of pool water as needed to maintain a bromine residual of 1-3 ppm at all times. Daily usage should be approximately 25 g of BROMINE TABLETS bromine tablets per 10,000 L of pool water. 4. Periodic superchlorination of pool water is recommended. Follow label instructions of superchlorination product being employed. Maintain recommended daily levels as determined by testing kit. 2. For outdoor pools, chlorine residuals can be protected from destruction by sun’s rays by adding 300 g of stabilizer (cyanuric acid) per 10,000 L of pool water to yield the required initial concentration of 30 ppm. 3. If using an automatic chlorinator, fill the chamber(s) with tablets and adjust flow rate, according the manufacturer’s recommendations, to maintain proper chlorine residuals. Adding pucks to the pool’s skimmer basket is an alternative chlorine feed method. Daily usage should approximate 25 g of AQUA FOOT per 10,000 L of pool water. NOTE: Hot weather, heavy pool usage, and rain may require higher usage rates to maintain proper chlorine residuals. AQUA FOOT contain stabilizer which can accumulate in pool water. Keep stabilizer within the range of 30-100 ppm by dilution with fresh water. 1. To minimize bleaching of vinyl liners, pre-dissolve required amount of SHOCK PLUS in a plastic pail with concentration not exceeding 1 kg per 10 L of water. Always add chemical to water, NEVER water to chemical. Add resulting slurry directly to pool water. 2. Initially, superchlorinate pool water with 150 g of SHOCK PLUS per 10,000 L of pool water. For best results, superchlorinate at dusk. 3. Maintain proper chlorine residual by adding daily over the pool’s surface, 30 g of SHOCK PLUS per 10,000 L of pool water, or as needed. NOTE: Hot weather, heavy pool usage and rain may require higher usage rates to maintain proper chlorine residuals. 4. Superchlorinate weekly using 150 g of SHOCK PLUS per 10,000 L of pool water when average daily temperature is 25°C-32°C. Otherwise, superchlorinate every other week. 5. For visible algae, super-chlorinate using 350 g of SHOCK PLUS per 10,000 L of pool water. Heavy algae infestation may require dosages up to 500 g per 10,000 L. Vacuum pool when dead algae settles. 2. For outdoor pools, chlorine residuals can be protected from destruction by the sun’s rays by adding 300 g of STAB/COND per 10,000 L of pool water to yield the required initial concentration of 30 ppm. 3. If using an automatic chlorinator, fill the chamber(s) with MAXI PUCKS and adjust flow rate according to manufacturer’s recommendations to maintain proper chlorine residual. Adding tablets to the pool’s skimmer basket is an alternative chlorine feed method. Daily usage should approximate 25 g of MAXI PUCKS per 10,000 L of pool water. 4. Periodic superchlorination of pool water is recommended. Follow label instructions of T.N.T. NOTE: Hot weather, heavy pool usage and rain may require higher usage rates to maintain proper chlorine residuals. MAXI PUCKS contains cyanuric acid stabilizer which can accumulate in pool water. Keep stabilizer within the recommended range of 30–100 ppm by dilution with fresh water. The ideal range is 30-50 ppm. OXY PRO performs effectively as a shock treatment in reducing organic contamination of swimming pool water. Eliminates chlorine smell and reduces skin and eye irritation. 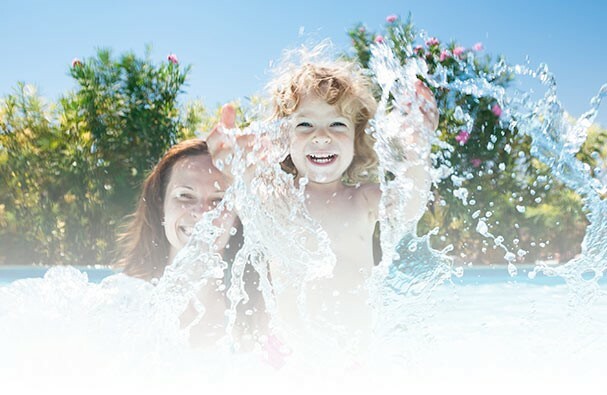 This oxidizing and reactivating treatment restores pool water clearness and ensures longer lasting chlorine power. Ideal as initial treatment at the start of the season followed by the use of a disinfectant. 1. Add every week 120 g of OXY PRO per 10,000 L of pool water. 2. Add required amount, sprinkling directly onto surface of the water or pouring the product into the skimmer while the filter is running. 3. Wait for 15 minutes before swimming. 1. For outdoor pools, chlorine residuals can be protected from destruction by the sun’s rays by adding 300 g of STAB/COND per 10,000 L of pool water to yield the required initial concentration of 30 ppm. 2. Maintain proper chlorine residual by adding daily over the pool’s surface, 40 g of STAB CHLOR GRAN per 10,000 L of pool water, or as needed. 1. NOTE: Hot weather, heavy pool usage and rain may require higher usage rates to maintain proper chlorine residuals. 2. Periodic superchlorination of pool water is recommended. Follow label instructions of T.N.T. 3. STAB CHLOR GRAN contains cyanuric acid stabilizer which can accumulate in pool water. Keep stabilizer within the recommended range of 30-100 ppm by dilution with fresh water. 4. While STAB CHLOR GRAN can be used for superchlorination by using 180 g per 10,000 L of pool water, care must be taken to avoid excessive accumulation of stabilizer. Maintain proper daily levels as determined by testing kit. ZAP actively destroys the organic residue in your pool water. It is an oxidizing and a clarifying treatment in one. ZAP accelerates the elimination of organic contaminants in pool water. This re-activating treatment restores water's sparkle. One pouch treats up to 54,000 L of pool water. 1. Place filter into filtration mode. Add a full pouch (300 g) per treatment by sprinkling ZAP around the pool, directly on the surface of pool water. 2. If water temperature is below 20 oC dissolve ZAP in a pail of lukewarm water before adding to the pool water. 3. Wait 20 minutes before using pool. Use ZAP weekly to keep water crystal clear. Maintain daily levels identified in the directions for use of the swimming pool sanitizer being used, as determined by testing kit.